Length: up to 9 cm. 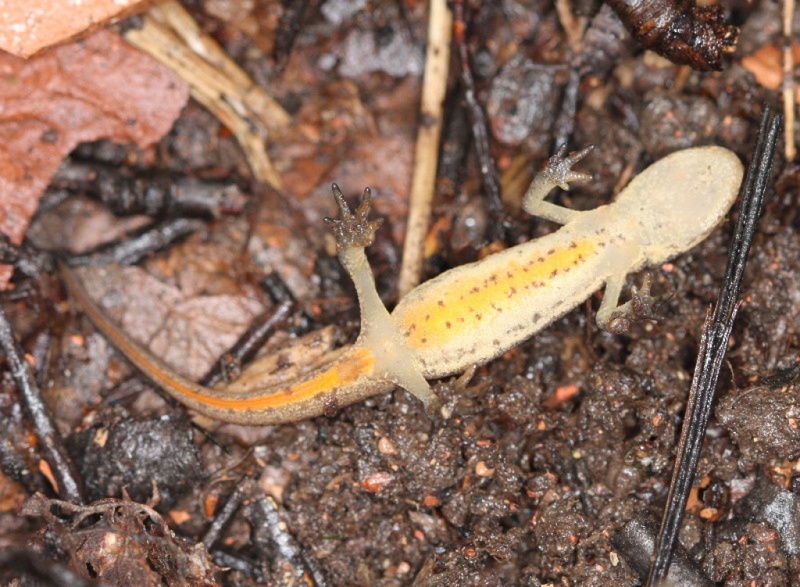 The Palmate Newt is the smallest British amphibian, and earns its English name from the strongly webbed hind feet that males develop during the breeding season. Both sexes have smooth skin, with olive green or brownish coloured upperparts and a yellow belly featuring a scattering of small black spots. The throat is not spotted and is pinkish in colour. Males are slightly smaller than females and have a 'boxy' appearance as a result of two ridges that pass along the back. In addition to the webbed feet, they also develop a very low, smooth crest during the breeding season, which extends along the back to the tail, where it forms a deep 'fin'. The tail has an orange central line passing along its length, bordered by two rows of dark blotches. 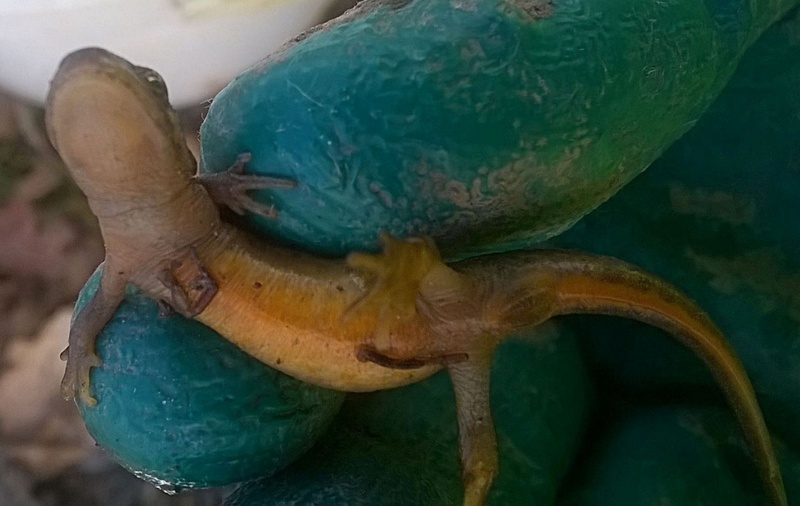 Female Palmate Newts are easily confused with those of Smooth Newts, but the unspotted pink throat is a good distinguishing feature. The Palmate Newt breeds in a range of still and occasionally running water, including ponds, puddles, woodland and heath pools and even mountain lake edges. 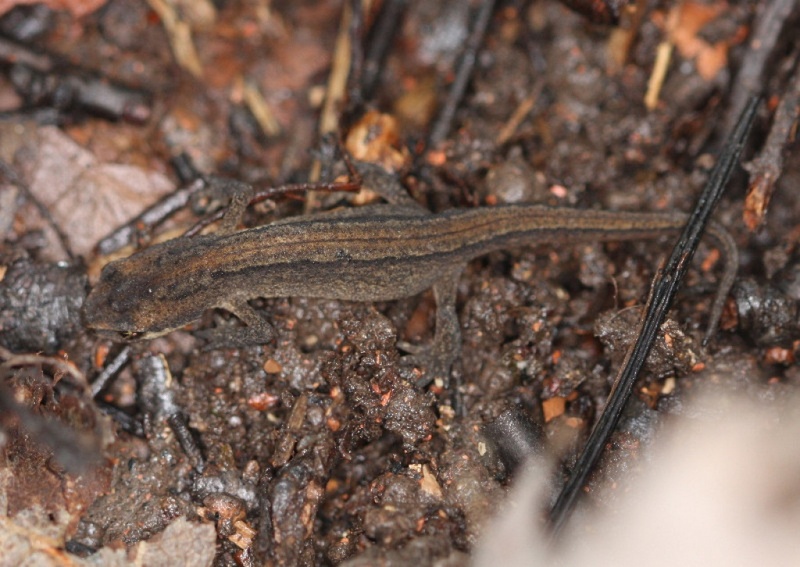 It shows a marked preference for shallow soft-water pools on acid soils, which explains why the species is common on heathland in the South and West of England, and in moorland and bogs in the North. Ponds and ditches that do not support fish are preferred, and it is often found in garden ponds. All amphibians require good quality undisturbed terrestrial habitats around the breeding ponds. Around water from end of February until they go onto land in June/July where they will stay until hibernation in November. Their diet is very broad, and includes zooplankton, freshwater shrimps and hoglice; when they are on land they eat a wide range of invertebrates, the capture of which is aided by the possession of a sticky tongue. They are active at twilight and/or just before sunrise. This secretive newt spends most of the day in thick aquatic vegetation, coming out into open water only after dark. 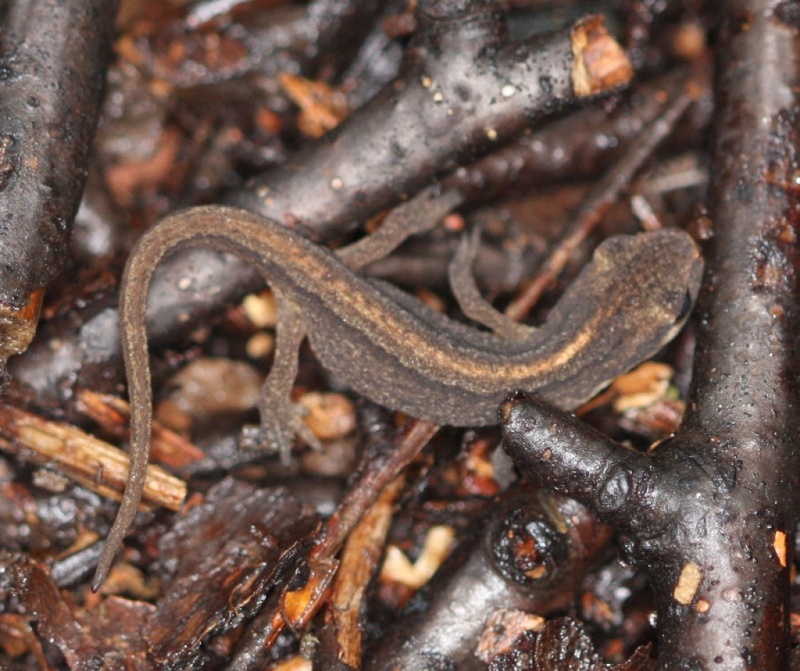 Palmate Newts hibernate from November to late February/March. In Britain it has a widespread but rather patchy distribution. It is rare or completely absent from the Midlands, East Anglia, and parts of Southern England and is most common in Wales and Scotland. Rare, mainly found in Charnwood Forest (principally Beacon Hill area) but also from the former colliery site near Nailstone.